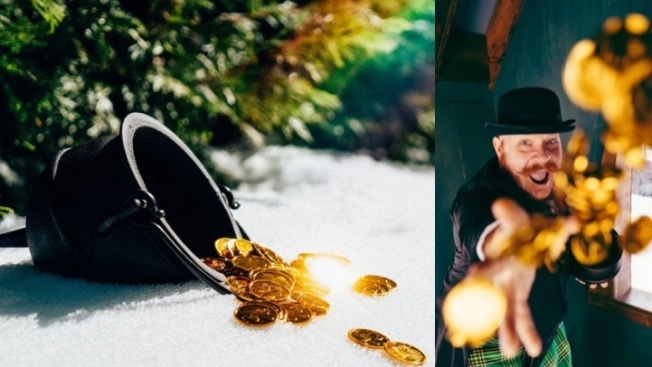 The Christmassy spot is making room for pots of gold and luck-filled fun. "Shamrocks and Shenanigans" will festively fill the Lake Arrowhead-close destination on March 16 and 17, 2019. If you were tasked to name a season's first major holiday celebration, and then its last, you might need to take a few moments when presented with, say, summer or fall. But not winter. The coldest stretch on the calendar begins with Christmas, when the season is but a few days old, and when it only has a few days to go? St. Patrick's Day, sends it on its chilly and cheerful way. That this particular duo will meet up, merrily, near Lake Arrowhead, makes celebratory sense, then. Christmas and St. Patrick's Day aren't meeting between their two established dates, however; they'll be together, at SkyPark at Santa's Village, on March 16 and 17. The setting, of course, is pure ho, ho, ho, with cottages that look as though they emerged from a snow globe. As far as the pot-o'-gold part of the gleeful weekend? It's the Shamrocks & Shenanigans celebration, which will include "... character experiences, live music, special themed food, and beverages throughout SkyPark!" Follow the rainbow for ice skating, corned beef sliders, a snapshot with Shamus the Leprechaun (if you can find him, of course), and other goings-on. Wearing green on whatever day you jig by? Highly recommended, of course. But then, green is one of the prominent hues of the yuletide, making the Christmas-meets-St.-Patrick's-Day vibe even stronger, at least visually. An adult ticket is $42, a child's admission is $32, and senior entry is $32. It's still winter, for a few more days, and the holiday that's on the other side of the season, opposite Christmas, is embracing a bit of Christmas spirit, and lots of luck, near Lake Arrowhead.